Did you know all these pieces of armor are related to God's Word? Belt of Truth - God's Word is where we learn what is true and what is a lie from satan. 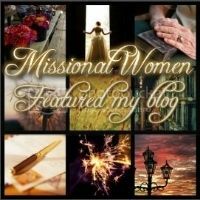 Breastplate of Righteousness - We can never be righteous in our own strength, no matter how hard we try, but through faith in Christ we have His righteousness. We're assured of this in God's Word (see Philippians 3:9). Shield of Faith - Faith comes from God's Word; the more time you spend in God's Word, the stronger your faith. Helmet of Salvation - A helmet protects your head. We protect our minds from the accusations of the enemy when we saturate them with God's Word. Sword of the Spirit - is the Word of God. A sword is going to do you the most good when you have it with you, which is why it's so important to memorize Scripture! Father, I thank you for the precious gift of Your Word. It's a slow process but I know it is through time in Your Word that I'm being transformed into the likeness of your Son Jesus. Thank you for allowing me to live in a place where I have easy access to Your Word, and protect those who spend time with you at risk to their lives. 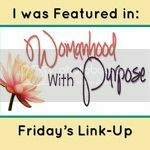 Linking up with "Leaving a Legacy" , "Life in Bloom", "Thankful Thursdays," "Thought Provoking Thursday", "Spiritual Sundays", and "Your Thriving Family"
Very good! A old Puritan by the name of William Gurnall wrote a 3 volume set called (The Christian in Complete Armour) back in the year 1665. I recommend the new modernized abridgement of this set of books to every one. The late Rev. David Wilkerson "who to me was my role model as a Christian, other then Jesus, he recommended this set for people to read and put in their Christian library. I have given a few of these sets away to different pastors. I have done teachings on Spiritual Warfare and think people today need to get back to the basics of Christianity, churches are out in left field. The cross and what Jesus done on the cross needs to be taught more then The Prosperity Message, The Word of Faith Message, The Purpose Driven Life Message. We need to let the Holy Spirit have his way, we don't need to do the things of the world to get a crowd in church. Let the Holy Spirit have his way. Sorry but I speak the truth!!! Like your posts, keep them coming and God bless you and prosper you in good health and Thanks for your posts, they are a blessing! I wonder, if we put on the armor of God intentionally every morning, how much more effective we'd be? Sometimes we're surprised by difficulty, but we are truly in a spiritual battle, and we need to treat life that way -- not paranoid, but prepared. Thanks so much for sharing the truth. Lori, visiting from Be Not Weary (www.lorihatcher.com). My daughter recently found the pieces to the armor at the Dollar Store. Gave the children's church kids a good reminder as they learned about God's Armor. I learned it as a child, too, and believe it has to be a deliberate decision to walk each day as a Christian soldier. I'm not sure I ever thought about all the armor relating to God's Word. Thank you for sharing that. That's one of the things I love about the Word. I've been a Christian for 45 years and still find new nuggets of truth. this is a great one for me. 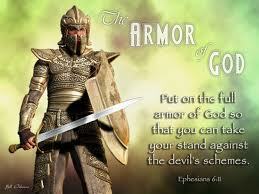 The armor of God....protecting in ways nothing else can. Love it. The Christian in Complete Armour can be downloaded on Kindle fairly cheaply. I had the set of 3 in paperback version and gave it away! It was fairly intense but by all accounts, the new modernized abridgement of these books is reported to be excellent. I try to pray the armor of God over myself and my husband daily and I really like how you connected each piece to God's Word! God bless you..
Good explanation of an important thing we all should do. Thank you for sharing. Thank you for this reminder. I love this scripture. I needed to hear this today. Thank you also for linking up at Leaving A Legacy!